Rhubarb cream is one of those old Swedish desserts that were always homemade. I have added strawberries to my cream. Thick rhubarb and strawberry cream as dessert is hugely underestimated. The rhubarb marries really well with the strawberries. It’s like a summer day in a bowl. I ate a lot of rhubarb cream when I was a kid. My mum used to get the store bought for me and my brother. We loved it. Sugary thick cream. What’s not to like? Strawberry was my favourite. We are it with ice cold milk. I have only now realised how easy it is to make. And the rhubarb with the strawberry is such a marvellous flavour combination. Fruit cream of any kind is a typical Swedish treat. It’s such an easy treat to make and you can, of course, choose what type of sugar and how much to add to it. 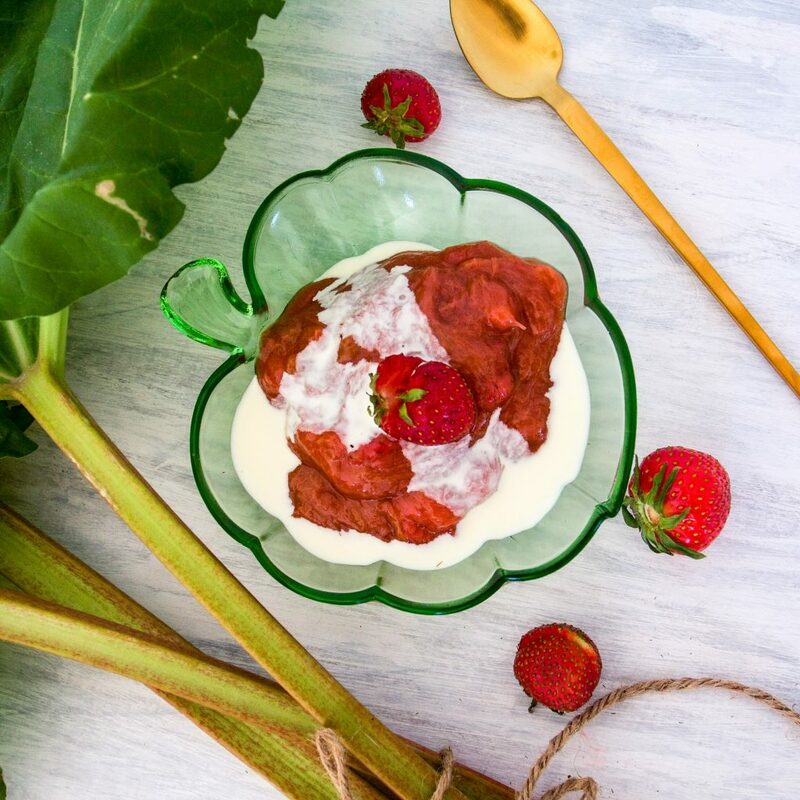 In my opinion, rhubarb cream with strawberries is best served with ice cold whipping cream. But I discovered, having nothing to add to my morning greek yoghurt that it’s a wonderful addition to the breakfast table. Tart, sweet and velvety smooth. Regardless of how you want to eat it, it’s the perfect way to preserve summer. 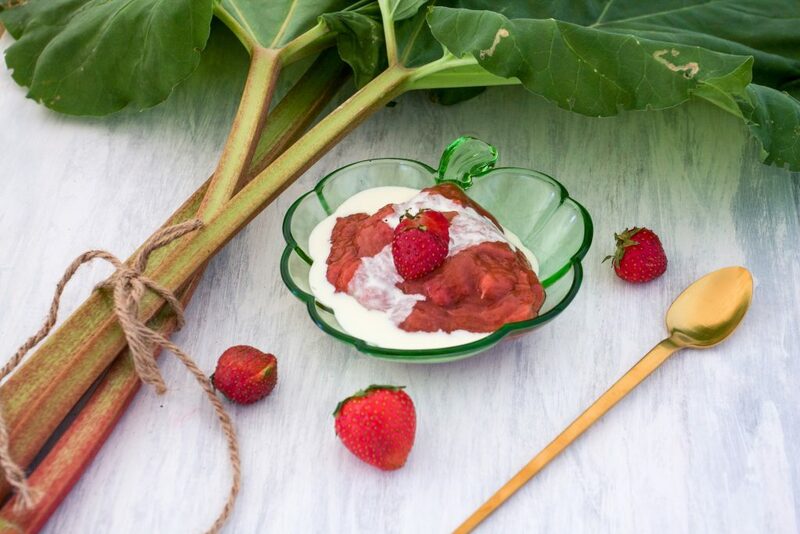 Make sure you save the rhubarb cream in a clean glass container. It will keep in the fridge for about ten days. If you make too much, you can freeze it too. Rhubarb and strawberry cream is a very typical Swedish snack. Perfect how the sour meets the sweet in one lovely dessert. Rinse and trim the rhubarb and strawberries. Cut the rhubarb into three-centimetre pieces. Half the strawberries. Put them in a pot. Add water, coconut sugar, lemon juice and vanilla. Bring to a boil for about five minutes. Let it simmer for an additional five minutes and thicken the cream with the cornstarch. Stir gently and often. When it's thick enough take it off the heat and let it cool. Serve with ice cold whipping cream. Without whipping it. Should you want actual fruit bites don’t mash the fruit while you are cooking it. Just stir it gently. Adjust the cornstarch depending on how thick you want the cream. It’s easier to use the cornstarch if you mix it with a little bit of water first. Then gently stir it with the cream. Otherwise, you risk getting lumps in your cream. Taste it while you cook it, for more sweetness add more sugar. Rhubarb can be quite tart. If you want to ditch actual sugar, you can use agave syrup instead. Other flavour pairings that go well with rhubarb are lemon, elderflower, vanilla and peach.